Diamonds have always been the most sought-after gems on earth, and for centuries, these precious stones have been desired and coveted across various cultures and geographies. I think “loving diamonds” is in a woman’s DNA. There’s no better way to stand out from the crowd than wearing a bold accessory with a bit of sparkle and. The diamond is a symbol of privilege, and like snowflakes, no two are exactly alike. Each has specific qualities that establish its value. Occasionally, nature will get creative and produce a diamond with almost magical colors: blue, pink, deep yellows and even green hues. Fancy-colour diamonds are highly prized, and even more so if their colour is the result of natural processes. Recent celebrity fascination with fancy coloured diamonds may also account for the sudden spiral in their popularity. According to the GIA, the demand for coloured diamonds has increased 102% since 1999. This season, yellow and brown coloured diamonds seem to be very popular, and it is no surprise that jewelers are dipping into this new champagne-coloured fashion trend! You will find plenty of variety in brown diamonds, from the “champagne” (lightly tinted) to the darker “cognac” diamonds, and each is a must have in one’s jewelry collection! The key to wearing browns diamonds is to go for a contrast. 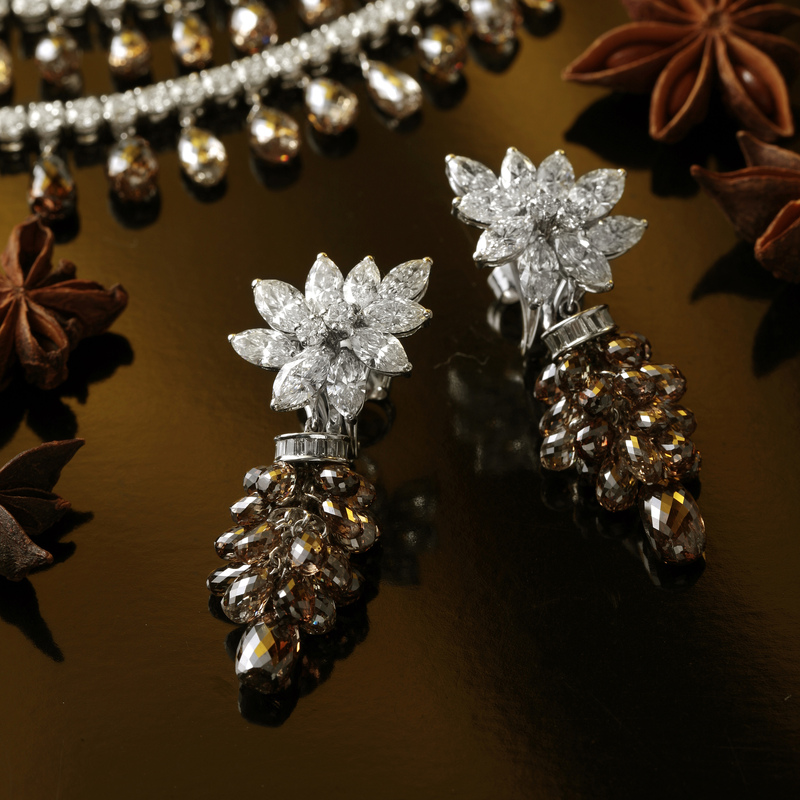 Warm toned coloured diamonds pair best with the brilliance of colourless diamonds! Lea Michele’s Brown and White Diamond Mesh Necklace. Saffronart’s Autumn Online Auction of Fine Jewels & Watches on October 30-31, features an important necklace and pair of ear pendants set with brown and colourless diamonds. 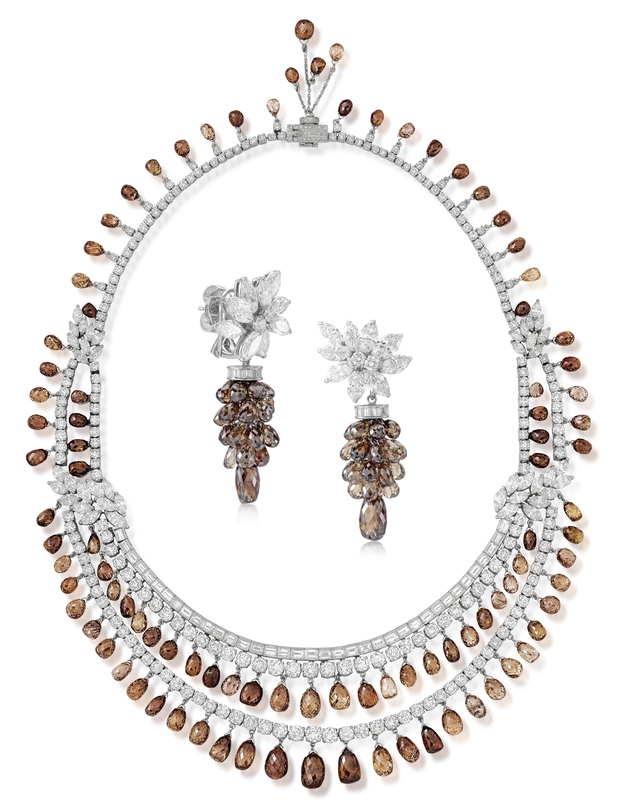 The necklace features two striking rows of round full-cut diamonds and diamond baguettes, and spacers set with marquise-shaped diamonds, which suspend a graduated fringe of coloured diamond briolette beads. The earrings are of a similar design, but versatile, in that the cluster of coloured diamond briolettes suspended from each can be removed, so they may be worn differently. This suite is one of those statement pieces that’s sure to garner glances and envy whenever and wherever you wear it!